A three-year, $750,000 grant from the U.S. Department of Agriculture will help Cornell University’s Small Farms Program (SFP) work with a coalition of groups to broaden its support for new farmers. The funding, from the USDA’s Beginning Farmers and Ranchers Development Program, will help the project draw on the strengths of diverse partner organizations to break down those barriers, including limited access to training, capital, and land. “Our goal is to improve beginning farmer success by providing training both to the farmers and the non-profits that serve them,” says Frenay. Expand its online courses and develop new educational resources, including production-oriented topics, how-to videos and on-the-ground workshops. Work with middle- and high schools to develop fun events and learning opportunities to recruit young people to careers in farming. Identify and address barriers for farmers wanting to scale up production to meet demands of markets beyond direct-to-consumer sales. A dozen non-profits from around the Northeast that train and support beginning farmers. To stay informed about the N.Y. Beginning Farmer Project, sign up for the free monthly Small Farms Program’s e-newsletter and/or visit the N.Y. Beginning Farmer website. Update [11/25/2009]: See also Cornell Chronicle article. An October 27 article in Cornell Alumni Magazine, Rotten Tomatoes – Anatomy of an ag epidemic, chronicles last summer’s late blight outbreak that ravaged tomatoes and potatoes in the Northeast. 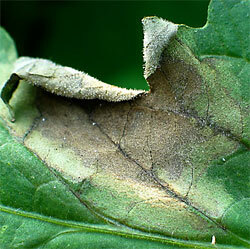 Meg McGrath’s late blight images. By removing the least amount of existing vegetation on the Commons, we don’t have to start from scratch. We can continue to benefit from trees that have been around for 30 years in terms of providing shade, sequestering carbon and providing other services. Nina Bassuk, professor and director of the Urban Horticulture Institute and chair of the Ithaca Shade Tree Advisory Committee on the benefits of choosing a redesign plan that maintains the existing look and feel of the Commons. As part of the Career Explorations class for new Plant Sciences undergrads, a networking event will be held on November 2nd. This will be an exciting fast-paced occasion for new students to meet and greet Plant Sciences faculty, staff, and grad students. The event will take place during the weekly Department of Horticulture seminar time slot on Monday November 2nd, 2009 at 4 PM in Plant Sciences Building, Room 404. Networking will be organized “speed dating” style – in which individuals will be paired for a brief conversation; after two minutes a bell will ring and your conversation will switch to the next person down the line. By the end of the event you will have met every new Plant Sciences student! Let’s show the Career Explorations students the diversity and depth that our departments have to offer! We have tremendous diversity in the Department of Horticulture. This is our opportunity to show it off! Please bring a dish to pass from your up bringing, something of a family-style favorite, and a bottle (or two) of your favorite beverage to share (doesn’t have to be alcohol). The potluck will start at 6:30 p.m. with lectures beginning at 7:30. The only rule the presenters must follow is to not link the two topics during their own talk… that’s for the audience during the joint question and answer segment to follow. Best question will receive a prize. All are welcome to attend. We hope to see you there! Update [11/6/2009]: Cornell Chronicle article: Cornell receives nearly $850,000 to improve specialty crops. From an October 15 news release from the New York State Dept. of Agriculture and Markets. $199,750 – Reducing the Impact of Phytophthora Blight on Vegetables in New York (Cornell University). $35,055 – Developing a Strategy to Reduce Fire Blight Infection of Apple Rootstocks (New York State Agricultural Experiment Station). $39,189 – Improving Forecasting and Management of Strawberry Powdery Mildew (New York State Agricultural Experiment Station). $82,251 – Improving the Competitiveness of the Snap Bean Industry in New York through Resistance to Aphid-Transmitted Viruses (New York State Agricultural Experiment Station). $82,816 – Increasing Utilization of Integrated Pest Management Tools in the New York State Christmas Tree Industry (New York State Integrated Pest Management Program). $54,450 – Identifying the Health Benefits of New York Peaches and Apricots (New York State Agricultural Experiment Station). $189,064 – Testing New Botrytis Leaf Blight Onion Lines & Hybrids to Develop the Best Strategies for Disease Control on Conventional and Organic Farms (Cornell University). $72,620 – Advancing Adoption of Reduced Tillage Systems in Conventional and Organic Vegetables in New York (Cornell University. $57,025 – Demonstration of Northeast-based Honeybee Production & Disease Management (Johnson’s Honeybee Farm). $90,672 – Reducing Production Costs and Improving Wine Quality through Root Zone Management (Cornell University). See news release for short project summaries. Researchers at Cornell University developed them, along with about a dozen varieties that grow well in New York and have flavors that rival the most popular potatoes in the United States. So growing Keukas here is a no-brainer? Cornell can only wish. Despite the problems, New York farmers continue to grow what their fathers grew and what consumers demand — the heavily marketed Yukons and familiar baking potatoes like russets — and most chefs prefer cheap potatoes shipped in bulk from the Pacific Northwest or Canada. “We have to educate ourselves and then educate the consumer,” [Orange County Farmer Cheryl] … Rogowski said. John Mishanec, an agricultural specialist with Cornell Cooperative Extension, has become something of an evangelist for Cornell-bred potatoes. In 1904 New York State grew 435,000 acres of potatoes. This year there are about 17,000 acres, most of them planted with starchy varieties by large growers in western New York who mainly supply potato chip makers. But potatoes are gaining popularity at farmers’ markets and farm stands in eastern New York, Mr. Mishanec’s territory. Many are varieties Cornell has released in the last 15 years. In addition to Keukas, they include another firm yellow potato, the Lehigh; Adirondack Reds and Blues; and two white varieties, Salem and Eva. Excerpts from an article from the CALS newsroom, Home Grown: Cornell Dining Serves Up Locally Grown CALS Produce. Special thanks to Steve, Melissa and others who help get the food from the farm to campus. 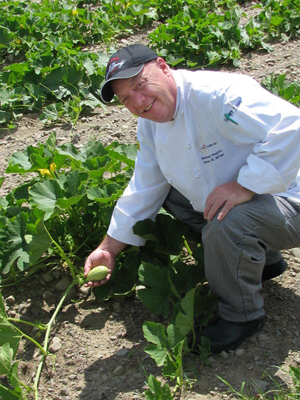 “As part of the Farms-to-Dining Initiative, Cornell chefs are now using produce grown at Cornell University Agricultural Experiment Station farms near campus. This past growing season, CUAES’ Homer C. Thompson Research Farm near Freeville and Campus Areas Farms devoted several acres of idle farmland that was not needed for CALS’ research to fill Cornell Dining’s desire to include home-grown vegetables in the two million meals served annually in the popular all-you-care-to-eat dining halls on campus. “’Getting local food at Cornell has required hard work on the part of a lot of people,’ says Melissa Madden, CUAES organic farm coordinator, who supervises the Dilmun Hill Student Farm. While Cornell Dining worked with the Dilmun Hill in the past, the student-run farm now primarily caters to Manndible Café, located in Mann Library. Enter the chili cook-off Nov. 20. From the PPPMB Chili Cook-Off Committee (Julia Crane, John Gottula, Allison Jack and Jay Worley). It’s time to pull out grandma’s secret chili recipe because the Fifth Annual Battle of the Plant Sciences Chili Cook-Off Fundraiser is coming Friday, November 20, 3 to 6 p.m., 135 Emerson. The departments of Horticulture, Plant Biology, Plant Breeding, Plant Pathology and Crop and Soil Sciences should assemble their best chili chefs in three categories: 1) Meat, 2) Vegetarian, and 3) Wild-Card (contains at least one non-traditional chili ingredient). Students, faculty, and staff are all welcome to participate! Email chili entries to Julia (jmc457@cornell.edu), including the following info: 1) names of cooks, 2) department 3) category, and 4) name of chili. Registration deadline is Friday, November 13. We only have room for 25 chili entrants–so don’t delay registering! There will be prizes for the winners of each chili category and an invitation to present the winning chilies at the Great Downtown Ithaca Chili Cook-off & WinterFest. The Cook-Off will also feature a door prize raffle with over $600 in prizes from local businesses! Thanks for your participation and we hope to see you there. Buy wine grapes and juice at Cornell Orchards. Cornell Orchards has a bumper crop of wine grapes. Varieties include Finger Lakes Reisling, Seyval Blanc, Foch, Pinot gris, Chardonnay, Lemberger, Cabernet franc, Concord and a few odds and ends, mostly hybrids, that could go into a blended white or red. 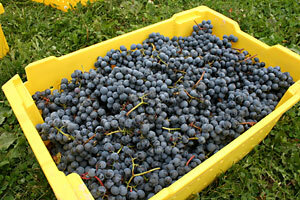 Buy the grapes (call for pricing) or let us press the juice for you. Reisling, Cabernet franc, and Chardonnay are $20/gallon. Other varieties are $7/gallon. All orders will be “first come, first served.” Please call or email to place your order: 255-4542 or orchards@cornell.edu You must provide your own containers. Visit the Cornell Orchards website for hours, map and more information. Wine grape vines at Cornell Orchards.